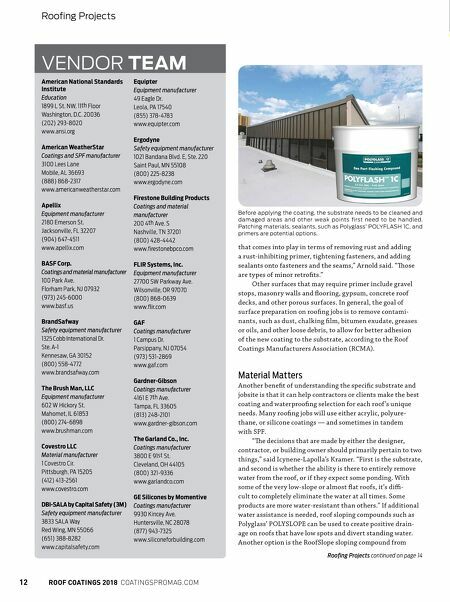 COATINGSPRO ROOF COATINGS 2018 13 SPONSORED CONTENT CJ Spray CJ Spray has long been recog- nized as a problem solver for contractors who have diffi cult spray applications. As single component protective coatings continue to get thicker - feed pumps have become common place to supply material from 55 gallon drums to the spray pump. at challenge has led CJ Spray to the design the new MaxForce AC-Series pumps that incorporates an air compressor into the design that powers a 55 gallon feed pump. Now one single gasoline engine operates the hydraulic spray pump and an air compressor for the feed pump. is makes the system more portable and easier to use for the user. For more information go to www. cjspray.com/maxforce. 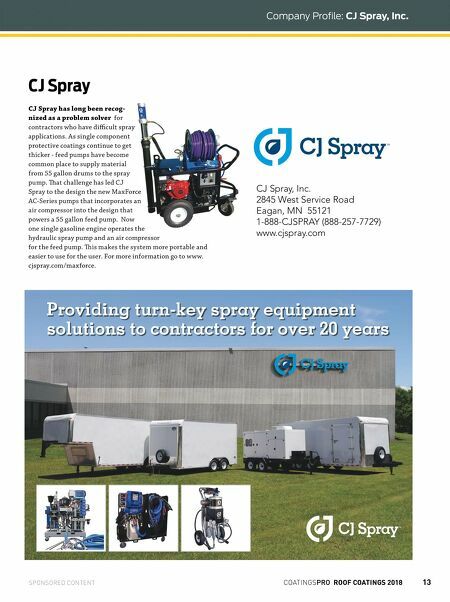 CJ Spray, Inc. 2845 West Service Road Eagan, MN 55121 1-888-CJSPRAY (888-257-7729) www.cjspray.com Providing turn-key spray equipment solutions to contractors for over 20 years contractors who have diffi cult spray Spray to the design the new MaxForce AC-Series pumps that incorporates an powers a 55 gallon feed pump. Now one single gasoline engine operates the Company Profile: CJ Spray, Inc.